Jack Butala: Jack Butala with Jill DeWit! Jack Butala: Welcome to our show today. 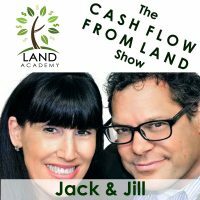 In this episode, which is Jill’s episode, by the way, we talk about why to use an answering service. 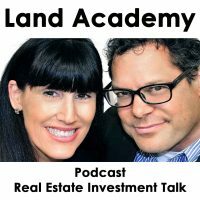 Jack Butala: Before we get into it, let’s take a question posted by one of our members on the LandInvestors.com online community. It’s free! Jill DeWit: All right. Justin asked, “I think I have an easy question, however, I have searched around for a bit with no luck.” Thank you, Justin, for trying to solve your own problem first. I have to add that in. Jack Butala: That’s the theme this week! Jack Butala: Your assumption’s right! Jack Butala: Do you want me to take this? Jack Butala: I usually see it as time limit to build. When somebody creates a master planned community, like Del Webb or Walt Disney … literally, I’m not joking. Del Webb and Walt Disney were good friends, by the way. Jill DeWit: I didn’t know that! Jack Butala: Del Webb created … he’s long gone, passed away. Jill DeWit: Were they together like in Florida or somewhere? Jack Butala: Yeah, Florida, Chicago, Arizona, California. Jack Butala: Like, Anthem is a master [inaudible 00:01:20] massive. Jill DeWit: Like did Del Webb follow him around and worry about property he build the homes? I would do that. Jill DeWit: And said, “You should live at Disneyland,” which I personally think is a great idea. Jack Butala: I’ll bet you … I bet Garden Grove is a Del Webb community. I’m gonna look this up. ‘Cause which is where Jill is from, originally. Jill DeWit: Mm-hmm (affirmative). I don’t know, it’s a good question. Jack Butala: Anyway, that Del Webb wanted to take it a step further. “Let’s just put all the retail and the fun stuff in the middle, and you can live in the suburbs, and then let’s just … by the way, let’s just plot it all and let’s, you know, subdivide it out all out the same … with one stroke of the pen and throw an APN scheme there and we’ll put the big houses over here with the townhouses over here, we’ll put the … ” That’s still in use today. “Let’s put the industrial wasteland over here.” That kind of thing. Jill DeWit: Property sitting there with random houses here and there. Jack Butala: … a barren subdivision with half of them there, yeah. There’s a bunch of those … If you go on a map and you look at the Pacific coastline of Washington state and some places in Oregon, you’ll see why there’s a time limit to build on certain stuff ’cause they don’t have a time limit to build and there’s beautiful houses with nothing around them. Jill DeWit: Exactly. The developers put in … they put in … they spent all the time and the money on the infrastructure, and putting the facilities in place. They want it to be used and they want you to be helping. Jack Butala: Well said, because think about running electrical line. If you run electrical line to one house, it costs the same amount of money to run electrical line to 50 houses on a street than it does to one, so wouldn’t you rather have 50 customers for one expense, or one? Jill DeWit: Right. They paved it, it’s all there, ready to go. They want you in there using it, so that’s why they came up with this stuff. Jack Butala: That’s what the time limit to build is. If you buy the lot, you have to build a house on it, or build something on it within two years. That’s what I see usually. Jack Butala: For us, a time limit to build as investors for land is a real bad thing. Don’t buy property that has a time limit to build on it. That’s my advice. Jill DeWit: No, no one got mad, there’s no crying! Jack Butala: We answered the question directly! Jack Butala: Today’s topic why would you ever use an answering service? This is the meat of the show. Jill DeWit: Why would you not use an answering service? Jack Butala: That’s what the show should be called. Jack Butala: Like everything, I learned this the hard way. Jill showed me the light. Jill DeWit: If you think that it’s gonna be easy and efficient, an easy and efficient use of your time to field every single phone call coming back when you send out mailers and offers to sellers, you’re nuts. That’s really not the best use of your time. That’s the key here. Having an answering service to field the calls is such a time saver, I cannot tell you. Imagine this, you send out a campaign, you’ve got 100 people calling you back that week. Do you really have time to take 100 calls? Even if you’re not working. A lot of our people have day jobs, and it’s darn near impossible to take all the calls. Jack Butala: Well, it is impossible, unless you have the coolest job ever and you don’t have to do anything. Jack Butala: “You’re a bleep bleep bleep bleep bleep! I would never sell you my property! Beep bleep bleep.” Who raised you? Jack Butala: [inaudible 00:06:13] 95. Jack Butala: Or a CRM. Jill DeWit: … or a CRM. You know what I mean? Send you the information, have this information ready for you, or the top third, the ready to go people, here’s all the details. The middle third is, “We wanna talk about it.” They don’t like the offer, but they do want to sell. Then the bottom third is, “You’re crazy, don’t call me again,” or, “Don’t bother me.” That’s fine. Then you can sit down on a Sunday afternoon, or whenever it’s … or you’re home from work, whatever it is, and look at those and go, “Alright, and now I’m gonna do my due diligence, pick the ones I want, and be the deal-maker.” That is the point. Jill DeWit: You need to be not a phone answering service. You need to be a deal-maker. You need to be looking at these, picking the ones you want, and acting on those. Jack Butala: It’s just from an efficiency standpoint, you can’t beat it. Jack Butala: There’s resources like ParcelFact out there, where you literally type in the APN while you’re on the phone with the person and you make a decision whether or not you’re gonna buy the property or not, right on the spot based on the map. There’s a bunch of stuff. We should do a whole show on stuff you should spend your time on and stuff that you shouldn’t. Jack Butala: We will do that show next week, but answering a phone is not something you should do. You want to spend your time calling the people back who really want to sell their property and putting a deal together. Jack Butala: Whether it’s doing the deal yourself, or through an escrow agent. Jack Butala: Hey, by the way, you do not, in general, want to close your own deals, unless you’re brand new. Jack Butala: It’s just not efficient. Jill DeWit: Right. That’s another show that we’ll do that on here, too. What Jack means is, now they want to … you’ve reached the deal, they love your offer price, you look it up, you love the property. This is like run to the bank situation. You should not be the one now running to the bank and you shouldn’t be the one getting the notary, you shouldn’t be the one to handle the transaction, but that’s a whole other thing … ‘Cause you need to be the deal-maker! You need to say, “Yep, we’re buying that one, move on.” “Yep, we’re buying this one, move on.” “Oh no, we’re not buying this one. Next!” That’s what you should be doing all day long. Jack Butala: Let’s say you’re kinda good at this, like Jill and I. Philosophically, should you do your own laundry? Jack Butala: Clean the house? Jack Butala: Do the yard? Jack Butala: Raise the kids? Jill DeWit: Yes, if I have to. Jack Butala: Can you outsource raising kids? Jill DeWit: Yeah, you can! Jack Butala: Let’s take a step back. Should you wash your own car? Jill DeWit: Isn’t that what boarding school’s for? I’m just kidding! You remember when we were kids, that used to be the thing our parents used to say, “We’re gonna send ya to boarding school!” Nobody says that anymore! Do they even exist? Jack Butala: Oh, yeah! Are you kidding me? Jill DeWit: Shut up! Really? Jack Butala: At military school, yeah. Jill DeWit: Brilliant. That does my heart good. Jill DeWit: People really do this! Jack Butala: … his parents were done! Yeah. Jack Butala: Especially if it’s the third or fourth kid. First kid, you’re a little like, “I can fix it!” You’re still delusional about the fact that you have any control over this at all. Jill DeWit: Oh, my God! Jack Butala: Let me tell you something, listener, about kids. Jill DeWit: Oh no, here. Jack Butala: That’s it. About 90% of that’s how they are. 90%. Jack Butala: You only have 10%, maybe, control over the kids. When they’re real little, really, really little, and they’re happy and laughing, they’re gonna be happy and laughing when they’re 40. If they’re all morose and like, “Who the heck are you? You’re my parents? You’re … get out of my life!” If they’re like that when they’re one, that’s how they’re gonna be when they’re 14. Jack Butala: You can see! Jill DeWit: You can tell, as a baby. Jack Butala: In the first month, you can see. Jack Butala: Here’s the other thing, since we’re on the topic. I used to think it was gender-specific. Jack Butala: It’s not! We have some friends who have … their girls are picture … just a delight to be around and their boys who are just a walking mess! Jill DeWit: What about that little boy? We were outside at a little party yesterday out in front of our house and there’s a little boy sitting on the wall all morose, he looked like he was in a time-out, and the mom’s like, “No, that’s just him.” It’s like a self-imposed time-out! What kid does that? It was really weird. Jack Butala: That’s how he’s gonna be when he’s 80. Jill DeWit: You’re right! He’s just sitting there, pouting, while everybody else is playing, for no reason. That’s really funny. Jack Butala: Maybe he wants to wear girl clothes or something. Jack Butala: He’s just being denied his natural self. Jack Butala: We don’t know! Jill DeWit: Eyes over here! Eyes on the script. Jack Butala: Is this playing? Jill DeWit: It’s a little bit … yeah! Jack Butala: [crosstalk 00:12:23]. There’s nothing wrong with it! Jack Butala: My gosh, shut me down! Jill DeWit: What are you gonna do? Jack Butala: What’s this show about? Jill DeWit: Okay. You’re starting to scare me. Jack Butala: You know what? The truth is that … This a lot of years ago. I seriously put a woman’s shoes … men, if you’ve never done this, do it. Jill DeWit: This is gonna be funny! Jill DeWit: Oh yeah, let’s do this in public! Jack Butala: … and try to walk! It’s insane how difficult it is to walk. Insane. Jill DeWit: That’s … All right, yeah, so this is great. Jill DeWit: Did you just tell men to go into a store and put on women’s shoes and walk around? No, yeah, there’s nothing bad that’s gonna happen after that! Jill DeWit: Oh, my goodness! Jack Butala: … now you have the time. Jill DeWit: That’s how you tie it on in? Jack Butala: Yes, it is! Jill DeWit: That’s how you tie it all together! That’s nice. ‘Cause you have all this free time now. You don’t need to be parenting! Jack Butala: No, the kids are in military school! Jill DeWit: Yeah, that’s fine! Whatever. Why use an answering service, and military school? Jill DeWit: And put on some women’s shoes! Jack Butala: And put some women’s shoes on! Someone else is answering your phone! Jill DeWit: What the heck! Whew! That’s great, and I thought my mom was Captain Random. Oh, Jack, you just took the title! Oh my gosh. Jack Butala: That is how you make an eight minute podcast 20 minutes! Jack Butala: Join us in another episode, where Jack and Jill discuss how to use information … that’s me! Jack Butala: This show is neither one of those, to get just about anything you want. Jill DeWit: We use it every day to attempt to buy property for half of what it’s worth and sell it immediately. Jack Butala: You are not alone in your will to not answer your phone. Jill DeWit: Whew. Admission. Wow! That went really sideways. It’s hilarious. Jack Butala: We started using a service. I’ve bought and sold a bazillion properties, and we started having our phone answered probably realistically, Jill, like a year ago. Jack Butala: One of the best things I’ve ever decided. We decided to turn into a company and provide it for everybody else ’cause it was so wonderful. Jill DeWit: August, that’s our target release date. Jack Butala: Right, for Jill Live! Jack Butala: Information and inspiration to buy undervalued property. I’m sweating.